Welcome to the second part of our in-depth review of Spider-Man from Stern. In this part we will look at the game's rules and see how it performs in areas such as lighting, sound, music, dots and overall gameplay. The we'll give our conclusion and game ratings. Although the game is now in production, the software is by no means finished. This review is based on different versions of code from 1.05 up to 1.30 and in these revisions there were some modes without rules, and I'm sure many of the display, light and sound effects will be enhanced and the whole package fleshed out over the coming weeks and months. It's unfortunate how games are released with code that is missing much of the final polish, since many operators will not take the opportunity to upgrade to the latest version once the game is on location. But the timescales involved - especially when the license is a movie with an imminent release date - make it almost inevitable. Without any further ado, let's press the start button and find out what happens next. First of all, as the ball is kicked into the shooter lane you get a quote from JK Simmons who plays Daily Globe Editor J Jonah Jameson in the three movies. Simmons' voice is the one providing the custom speech for the game and he injects plenty of sarcasm and barbed comments as well as providing the more mundane pinball-related quotes. The display shows your score in big clear numbers while at the bottom the player number and credits alternating with the replay score. You now have a choice of skill shot to try for. The regular one is to plunge the ball up the right loop and into the rollover lanes. The gate allowing the ball to flow round to the left loop is closed at this point forcing the ball into the rollover lanes. One lane is flashing and can be steered with the flipper buttons. Get the ball through the flashing lane for a skill shot award of 250K the first time, rising by 25K for each subsequent skill shot. You also get two other awards - a boost to your bonus multiplier of 5x and an increase in the pop bumper value. But there is a super skill shot achieved by plunging the ball more softly so it never reaches the rollover lanes, but rolls back down the right loop lane and hits the half-gate above the upper flipper. 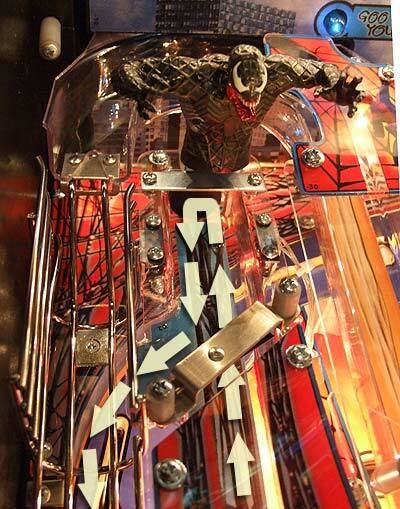 From there it rolls onto the upper flipper for the super skill shot across the playfield and up the side Venom ramp. This earns you double the points of a regular skill shot (500K the first time, 50K more each following time) and trades the other rewards for a boost to the Venom value of 100K. With your third skill shot you also get the opportunity to double or triple your bonus. Making your third skill shot at top rollover lanes gives you a double bonus award. If you make the Venom side ramp skill shot, you get a triple bonus award instead. However, as the top rollover lanes also award a +5X multiplier, you get a total of 10X from the top lanes as opposed to only 3X from the Venom side ramp. The top rollovers are also both much safer and far easier to collect. Skill shots are only available at the start of each ball (including extra balls) so your opportunities for collecting them are limited, but if you missed one and so lost the opportunity to get the double or triple bonus on the third skill shot, an extra ball gives you another 'shot' at it. But before we get a bonus like that we need to play the game. So with the ball at the flippers following either a regular skill shot, a super skill shot or a totally missed super skill shot, what do we shoot for? The clues are shown on the playfield by the inserts above the flippers. There are three basic type of feature to start and they can all run concurrently. The first are the Villains - the four Spider-Man characters located in different parts of the playfield and shown on the outer ring of the web; Green Goblin, Venom, Sandman and Doctor Octavius (Doc Ock). 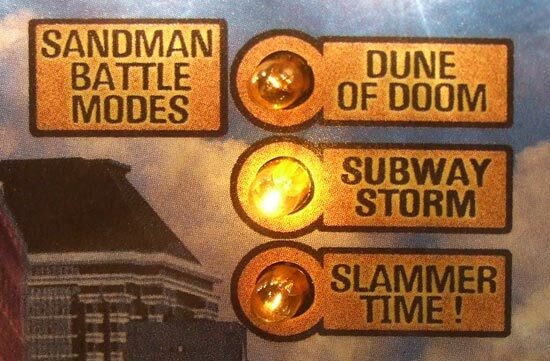 The second are the timed modes shown with the white inserts on the centre ring of the web; The Amazing Spiderman, Bonesaw, Rescue MJ, New Goblin and Daily Bugle. In this version of software, most of these were not completed but in all fairness, they appear to be the lowest scoring of the three features and so not such a great omission at this stage. The third feature is not shown on the web inserts but it is the main multiball mode; Black Suit Multiball. It's certainly not the only multiball but it is the one referred to by the lock inserts in the left and right loop lanes on the playfield. We'll look at each of these three features in turn. 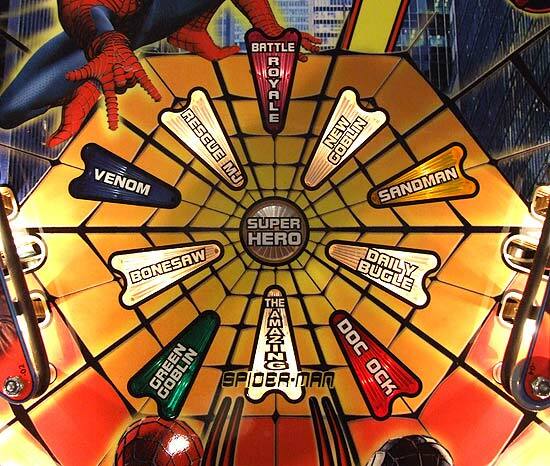 Each of the four villains has their own area of the playfield and their own colour coding. They also have their own set of three modes associated with them and all require a number of hits to their targets to start the modes which are played in the fixed order shown on the playfield or back panel. You can't start building up towards the next mode on a particular villain until you've made all the shots for his previous mode or until it has timed out. You can, however, have modes from different villains running consecutively. He's the Green Goblin so, naturally enough, his key colour is green. Green targets, green inserts and a green model. Like all the villains there are three modes associate with Green Goblin and to start them you hit his associated targets - the five pumpkin bomb standups. It doesn't matter which of the five targets, just hit any of them and your progress is shown on the display. Each hit is met with a shaking of the Green Goblin model. This was originally going to be motorised but now is driven by a solenoid and on this game at least, it was fairly ineffectual. Once you've hit him enough times, the first mode - Unity Day Festival - is ready to start by shooting him again. During Unity Day Festival, you keep shooting the Green Goblin targets to score more hits worth 750K and work towards defeating him. Unity Day Festival requires six hits to any of the green targets. Get six hits and you get a nice pay-off bonus of 3 million points, or 500K per hit. Like all the Green Goblin modes, Unity Day Festival is not timed but continues to run until you finish it or end the game. 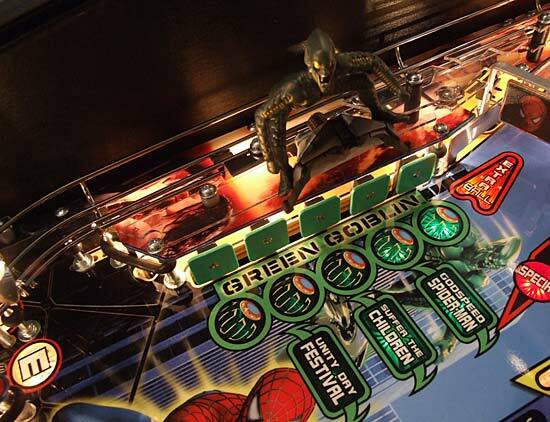 Once you do finish it, the Green Goblin insert in the web above the flippers is lit to indicate you're completed him. You can then move towards the next mode by shooting the green targets some more. After the required hits, the next mode - Suffer The Children - is ready to start with one final shot at the standup targets. Suffer The Children is essentially the same as Unity Day requiring you to shoot the Green Goblin to complete it but now only some of the green standup targets are lit. One target is lit at a time and it strobes up and down the target bank. Hit the lit target for 1.25M. Additionally, the previous two targets are also lit, but more faintly than the main target. Hitting one of the 'trailing' targets also counts as a hit but scores slightly less at 1.125M. You need eight hits instead of the previous six to complete the mode, so because the mode is more difficult, the bonus for completing it is increased compared to the Unity Day Festival mode, standing at 500K per hit for a tasty total of 4 million. After more hits on the Green Goblin targets, you're ready to battle for the third time. Shoot the Green Goblin again to start the mode. Godspeed Spider-Man is the mode's name and once again you're shooting the Green Goblin standup targets, but the difficulty has been increased again. The same single target is lit and it strobes left and right faster, making shooting it just a little more difficult. And to make you work of your points, you need a round dozen hits of the lit target to complete Godspeed Spider-Man. As before, there are two 'trailing' lit targets which aren't as brightly lit as the main one, and don't score quite as many points. Completing the required 12 hits earns you a pay-off of 500K per hit, totaling 6 million. Once you've completed the third mode, you're back at the start and shooting the Green Goblin to play Unity Day Festival again. The same number of hits are required to complete Unity Day Festival second time around, so it doesn't become any harder and the bonus for completing it is the same. The next villain we have to face is Venom. Battling Venom means shooting the two ramps that lead to and around him. Venom is colour coded blue, so the flasher behind him and the battle mode indicators are blue, as is his spider web insert. 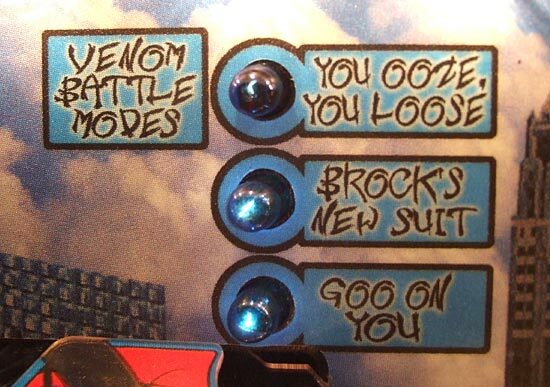 His modes are shown on the game's back panel rather than on the playfield and like all the other villains, there are three of them, played in the following order; Goo On You, Brock's New Suit and You Ooze, You Lose. There's a rather glaring spelling mistake on the back panel decal, spelling 'LOSE' as 'LOOSE' which is sure to cause some consternation. To start a Venom mode you need to make a number of hits on him. Those hits are made on the side ramp which send the ball crashing into the Venom model before returning down the short lane and onto the left ramp return wireform. Your progress towards starting the next Venom mode is shown on the display each time you make the side ramp shot. It took 4 hits to start each mode though that may vary depending on game settings. Complete the required number of shots and you start the first Venom mode; Goo On You. Goo On You is a countdown mode. When started, the Venom value starts at 1 million and begins counting down. Shooting either the side ramp or the left ramp collects the current value and resets it, increasing the value by 250K each time. But if you allow it to reach its minimum value of 500K, Goo On You will end shortly afterwards. Like most timer features in the game, there is a generous grace period during which - although the time has run out - out can still grab a shot, collect the score and re-start the mode. In general in Spider-Man, it is only once you see the mode total shown that you know the grace period has ended. The second Venom mode requires more shots up the side ramp is Brocks New Suit. There is a Venom value maintained throughout the game. It starts at 250K and can be increased by the spinner for an extra 1,250 points per spin, and also by scoring a Super Skill Shot, when the Venom Value is increased by 100K. Each completed Venom mode also adds another 25K to the Venom Value, although it has a maximum value of 750K. Brock's New Suit utilises this value by awarding it for shots to the side ramp and the left ramp. Both ramps score a single value which can be increased by a shot multiplier if you've collected it. Brocks New Suit is not timed but it continues until you've collected the six awards required to end it, even carrying on across balls. The final Venom mode is You Ooze, You Lose and again requires a number of hits on Venom before the mode begins. The mode again utilizes the Venom value and works in the same way as Brock's New Suit except this time it only gives the Venom value for shots to the side ramp and not the left ramp. Like the previous mode, You Ooze, You Lose continues until you make the required number of shots to the side ramp, which is eight. So that's Venom. The next Villain is the one in the centre of the shot map, The Sandman. Capable of taking any shape, The Sandman is a two stage feature in the game, requiring you to first complete the 3-bank of yellow standups before you can battle him. Again, there are three modes displayed on the back panel and as you might have guessed by now, The Sandman and his associated hardware are colour-coded in yellow. In truth, all three Sandman modes were the same in this software revision with the basic rules being to shoot the 3-bank until all three lamps in front are lit. There is a single strobing target insert whenever the target bank rises. Shoot the lit target first and the bank drops immediately. Hit one of the others and you have to complete all three before the bank lowers into the playfield. With the bank lowered, you can now make shots at The Sandman's targets - his opto sensor and the two yellow standups flanking him. When enough shots have been made, The Sandman rises to allow access to the saucer beneath him for the big pay-off. The value of the two yellow standup targets starts at 300K and builds throughout your game, adding 50K each time you play his mode. The centre Sandman sensor scores double the points of the surrounding standups and counts as two hits. Once the value has built up, hitting both targets and the Sandman sensor can net a tidy number of points for a single shot. Shoot him six times to get him to rise up the first time, eight times the second and twelve times the third. Once raised, shoot the ball under him and into the saucer beneath for a bonus of 2 million for the first mode - Slammer Time. ...while Dune Of Room - the third mode - add another 2 million for a 6 million pay-off when the battle is completed. So as you can see, there are some good points to be won from The Sandman but it is one of the more dangerous shots in the game, inviting straight down the middle drains as the ball rebounds from either the 3-bank or the Sandman standups. But as someone once said in another game; "Big risk, big reward". The final villain is Doctor Octavius who - in the second Spider-Man movie - becomes Doctor Octopus or Doc Ock to his friends (if he had any). Sitting between the right ramp and the right orbit is Dock Ock and his small but surprisingly effective collection of limbs. He operates much like The Sandman, moving up when hit enough times to allow shots to a saucer below. Like The Sandman, he uses an opto sensor in the lane leading to him to register hits, but his secret weapon guarding him is not a 3-bank of targets but a magnet used to stop the ball. 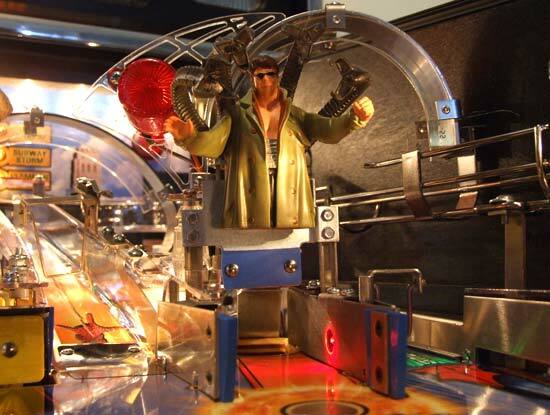 Doc Ock's three modes are displayed on the playfield in front of him. They are all multiball modes and displayed in the Doc's colour - red. The modes are played from the bottom up, so the first is Fusion Malfunction. Like the other villains, the procedure is to shoot him a couple of times to start the mode. Unlike The Sandman, Doc Ock starts in the raised position. So for Fusion Malfunction, the first shot goes into the saucer underneath him and we get a quote saying "Ladies and gentlemen, fasten your seat belts" before the ball is ejected onto the right ramp wireform. 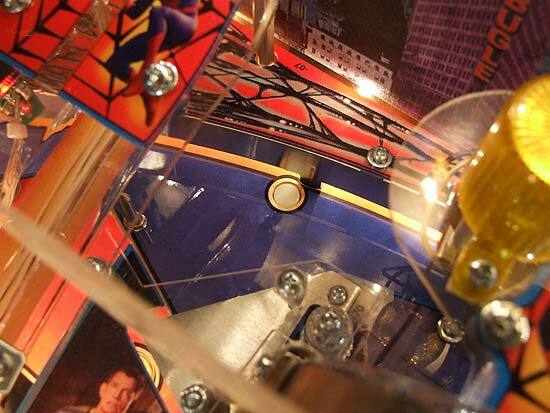 A second ball is auto-launched onto the playfield but the first ball is flung by the magnet against Doc Ock to score an immediate jackpot which starts at 250K. The red web arrows are then lit on the left loop, left ramp, right ramp, right loop and side ramp for jackpots. Shooting any of them scores a jackpot of 250K (or more if multiplied) and turns out the light. Collecting five regular jackpots then lights super jackpot at Doc Ock who rises up to allow the super jackpot shot underneath him. Being 'super' means it is worth five times the regular jackpot value. Collecting the super jackpot relights the arrows and adds 25K to the jackpot value. The mode ends when there is one ball left in play. For some reason, the Doc Ock shot is much harder to hit that it should logically be, but the ball does seem to rattle around the lane and often didn't quite make it. It takes an accurate shot to reach the saucer so backhanding it from the right flipper may be a more reliable and safer method. 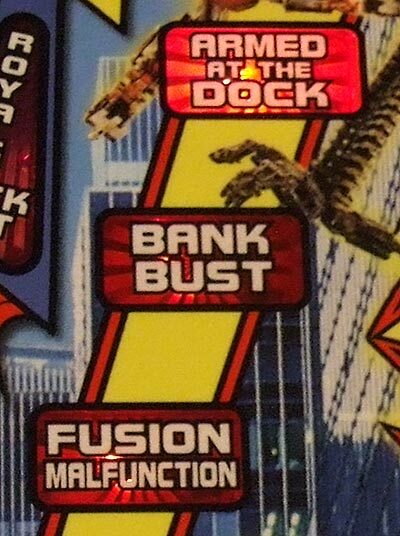 Once Fusion Malfunction has ended you can play the next Doc Ock mode - Bank Bust - by hammering away at his shot while the display shows how many shots remain. When Bank Bust is ready, a final shot to Doc Ock is again grabbed by the magnet but this time is held onto it as a new, second ball is auto-launched. The jackpot value begins at 750K and quickly starts counting down once the ball leaves the bumpers. The aim is to knock the first ball off the magnet using your new ball. The best way to do this is to use the upper flipper and flip as the new ball passes. It's a fairly easy shot and only the unaware should miss it, in which case the job is made quite a bit harder. If the game auto-launches the ball into the pop bumpers you'll loose valuable time, so you may want to softly manually launch the ball straight onto the upper flipper. Don't flip the upper flipper too gently though, or the second ball can gently snuggle up to the first, as they both sit tantalisingly out of reach of the flipper on the magnet. When you do knock the first ball off the magnet, the countdown stops and the current value is your jackpot value for Bank Bust multiball. If the countdown reaches 400K then the ball is released anyway and 400K is your jackpot value. A third ball is then auto-launched, all the red spider arrows are lit for jackpots. Any multipliers on any shots also apply. As you collect each of the six jackpot shots they are no longer available, until you complete them all. Then, Doc Ock opens up for a super jackpot which is worth the total of the six previous jackpots. As before, when you're down to one ball the mode is over and you have that short grace period to grab a final jackpot. 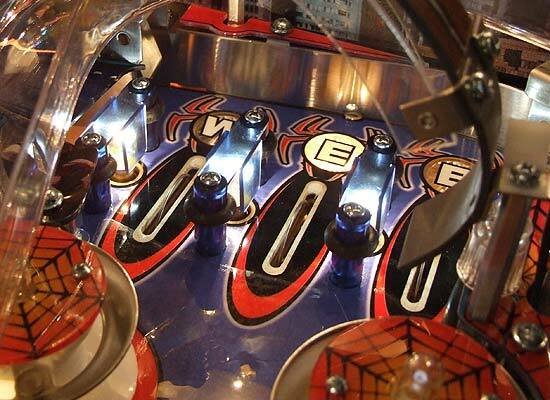 After another volley of shots at Doc Ock, you'll be ready for his final multiball mode Armed At The Dock. This is a 4-ball multiball mode where, like Fusion Malfunction, the ball is grabbed by the magnet to start the mode, while the remaining balls are auto-launched. The grabbed ball is thrown against Doc Ock to score the first jackpot of 400K. The number of jackpots needed to light the super jackpot starts at 1 and increases by 1 each time the super is collected. The first one is given to you by the magnet, so Doc Ock opens up for the first super jackpot which, like all the super jackpots, is worth the total of all jackpots collected since the last super. After that, the red spider arrows are lit for two jackpots which have increased by 50K to 450K. Collect them (with multipliers where appropriate ) to light Super Jackpot. For the third super jackpot, the regular jackpot increases in value by another 50K to 500K and the super jackpot is worth the total of the three jackpots needed to light it. As usual, fail to keep more than one ball in play and Armed At The Dock ends. You can then start the sequence all over again with Fusion Malfunction. So that's how all the villain modes work. As we already explained, you can have one mode from each villain active at any one time and running concurrently and that brings with it the problem of DMD real estate. Simply put, there's not enough room on a 128x32 dot matrix display to sensibly display the status of four modes along with your score. Then you can add in all the other modes we'll look at shortly and the multiball, all of which can also be running simultaneously, and the problem escalates further. In this revision of software that means sometimes a countdown mode is hidden and often, the required number of hits to complete a mode is only shown when the appropriate shot is made. So you need to keep your wits about you when playing and keep track of what timed modes are running. The mode feature lamps next to each villain can help here. In general, a solidly lit mode has been completed, an unlit one is yet to be played and a flashing one is currently running. When you complete a villain mode, apart from the end of mode score, you will also light all the red spider arrow for bonus points - a kind of victory lap with some tasty values to be earned. These start at 300K at the beginning of each ball and climb by 25K each time you complete one of the villain's modes. Any shot multipliers also increased the spider arrow values. Spider arrows also count towards you end-of-ball bonus, adding 5K for each lit spider arrow you shot since the start of the game. The next features on the Web are the timed modes. All around the playfield on all the major shots are six white web arrows. They are on the three ramps, the two loops and Doc Ock. These begin the game lit and as the shots are made each one extinguishes. Arrows initially score 150K each, increasing by 12.5K each time you complete them all, with the sixth being worth double points. When all six are out, the lock mechanism is enabled on both loops to trap the ball and start the next timed mode. You also get an immediate 500K for starting the mode. The timed modes all have a duration of 40 seconds and you are required to achieve a particular task in that time to complete and end it. When we initially reviewed Spider-Man, these were some of the least complete rules, but they have since been fleshed-out. Completing all the white web arrows also has a very nice side effect of applying a scoring multiplier to the next arrow shot you make. That multiplier applies to all scores made on that shot including jackpots and super jackpots, so that adds a nice extra layer of strategy to the game. You might choose to multiply the side ramp, but how are you going to get the ball to the upper flipper without making one of the other white arrow shots? Anyway, back to the modes themselves and starting any of them gives you an initial 500K score award. This mode requires you to make 100 switch hits in the allocated 40 seconds to collect the pay-off bonus. Each switch scores 100K (or 200K if it's a switch on a multiplied shot). Your task is to rescue Mary Jane (MJ). Who from and why is not clear but that's not important. What is important is to make 8 designated shots in the 40 seconds available. Three shots are lit at the start and they change after you make one of them, or if enough time goes by before you've shot any of them. The first lit shot is worth 750K, rising by 50K for each one you make up to 1.1M for the eight and final shot. This mode is all about the left and right ramps. Shoot either of these for an initial 600K award and you then need five more to complete the mode. If you combo these by alternating the ramps, the value increases by 200K each time. This mode has changed since the earliest software where the task was just to shoot the two orbits and the three ramps. Now you have to shoot the Spider Sense target bank first to light the six red arrow shots. You then shoot one of the lit shots before heading back to the Spider Sense targets to relight them again. Do this Spider Sense & red arrow shot combo three times to complete the mode. Shots to the Spider Sense bank start at 600K and increase by 400K each time, while the lit red arrow shots score 800K and also increase by 400K for each subsequent lit shot. This is perhaps the least interesting mode, with all six shots lit for values starting at 600K and increasing by 200K each time. As they are shot they extinguish, so shoot them all once to complete the mode. There are two other features on the playfield web we haven't covered yet - Battle Royale and Super Hero. Battle Royal is the mini-wizard mode for defeating all the villains. You defeat a villain by completing one of their modes. After you have completed the first mode from all of them, you have defeated them once and that lights extra ball. Extra ball can then be collected on the left orbit shot, though the ball needs to be stopped by the post and fall into the Sandman saucer for the shot to register. Later versions of the software overcame the problem of the post at the top of the orbit failing to deflect the ball into the saucer by awarding the extra ball just as soon as the left orbit switch is triggered, which makes it a little easier. After you have completed all the villains' second modes, you've defeated them all twice and that lights Battle Royal at the lock shot on the orbits. Defeating them all a third time means completing all the modes on all the villains, but if you manage that you get a nice easy special lit at the "light lock" target. This time, instead of battling just one villain, you're battling all four of them at once. Their respective shots - the Green Goblin targets, the Venom Ramps, the Sandman targets and Doc Ock - are all lit for big points. Four villains calls for four balls so that's what you get in this multiball mode. Each villain is initially worth 750K. Once you have got all four, shooting the right ramp collects a super jackpot which starts at a tasty 3.25M points. Collecting the super jackpot not only scores you a nice heap of points, it also relight all four villains, increases their value by 50K and increases the next super jackpot by 500K. But that's not all, because collecting the super jackpot also adds a ball to the multiball. This can be a vital weapon to have if you've just lost all but one ball, but the Battle Royale total display hasn't come up yet. That's because there's a grace period during which you can revive Battle Royale by shooting the right ramp if it's lit for super jackpot and getting another ball shot into play. You can sometimes do this if there's still one villain to defeat if you get them quickly and then immediately shoot the right ramp. It's a great feeling if you manage to bring Battle Royal back from the dead. If you don't manage it though, the total is displayed and Battle Royal is over. In the attract mode display there is a separate high score entry for the highest Battle Royal scorer. The final item in the web, right in the centre, is Super Hero and as you might guess, it's the Wizard Mode. But unfortunately you might also guess something that deep in the game gets a lower priority and it doesn't exist in this code version even thought there is a high score entry for it. Something of a disappointment, certainly, but not that surprising either at this stage of the software. We'll revisit Spider-Man just as we did with Family Guy to re-appraise it once it gets somewhere near finished. If it's hard to find a Super Hero when you need one, let's move on to something more accessible. 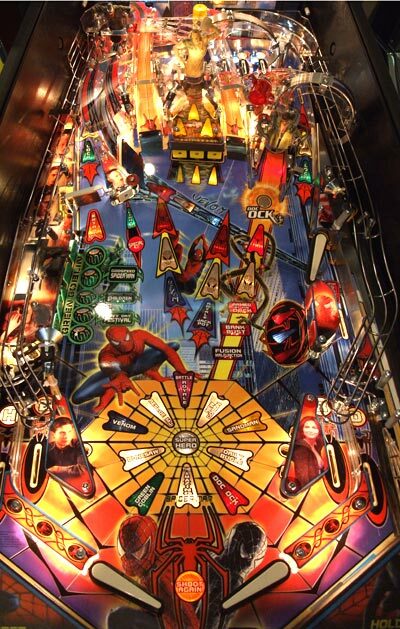 We've already seen how each Doc Ock mode is a multiball but the main multiball is called Black Suit Multiball and it is the one referred to by the Light Lock target and the lock inserts. Starting it is remarkably simple, you simply shoot the Light Lock target which lives up to its name and lights the lock arrow on both loop shots. Shoot either loop and the ball should head to the back of the game where it meets a nylon post which should be raised by this time. 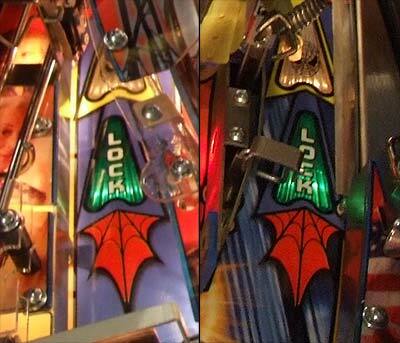 This post stops the ball and causes it to drop down the playfield and into the Sandman saucer to register the lock. Sometimes though, as with the extra ball, the ball isn't stopped and continues on its loop. Later software actually awards the lock when the left or right orbit switch is triggered, even if the ball doesn't make it all the way up the orbit lane. 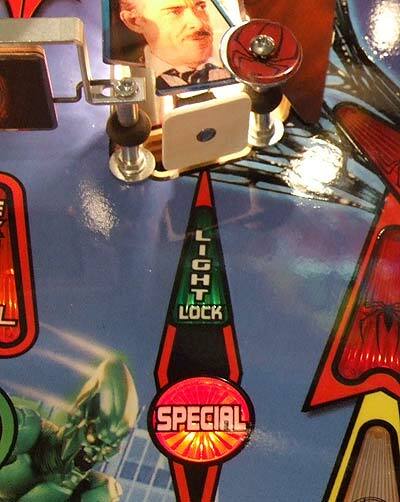 The lock is a virtual one, and once the display and sound effects are complete, the ball is then ejected from The Sandman into the pop bumpers in the normal way. For subsequent plays of Black Suit Multiball you need to hit the lock target more than once to enable locks, making it just that little bit harder to start. Lock three balls and as soon as the third triggers the orbit lane switch or settles in the Sandman saucer, Black Suit Multiball begins. It is a three ball multiball, so two balls are auto-launched and all six red arrow shots are lit for jackpots. The value of the jackpot is built up during the game. It starts at 250K and is increased by the pop bumpers by 500 points per hit. The initial jackpot value sounds low, but as you can see, in a reasonable game, that value will increase significantly. And remember, those multipliers are still in effect to double the value of some shots. Each of the six lit shots needs to be shot twice to collect the jackpots. Once this is done, a number of super jackpots become available on the left and side ramps.The left ramp awards a super jackpot worth 4x the regular jackpot value, while the left ramp is a more impressive 8x jackpot value. There are two super jackpots available on both ramps, making them worth 24x the regular jackpot in total. When these have been collected, the six arrowed shots re relit and the process starts again. This continues until all but one ball has drained. Black Suit Multiball is quite easy to start the first time, requiring just six shots (Light Lock target + left loop, repeated 3 times), so most players will get it once per game. Its scoring is well balanced and in keeping with other scores in the game, although the value of super jackpots may make it more attractive when they are included. 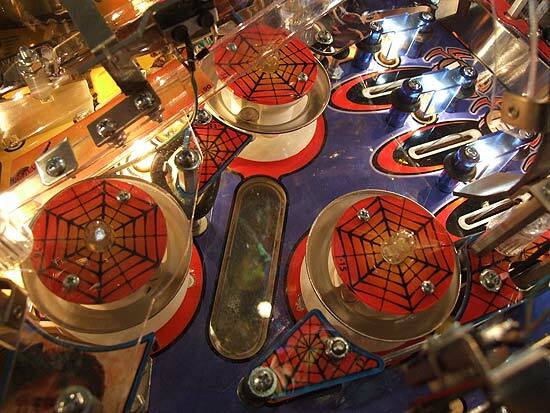 We spoke about pop bumpers increasing the Black Suit Multiball jackpot score earlier, but they do more than just that in Spider-Man. The bumpers score points in their own right and start out at 10K per hit at the beginning of each ball. A regular skill shot will double the points awarded. The pop bumper scoring is split into levels and you need a certain number of hits to complete a level and move up to the next one. When you first start, you need 25 hits to complete level 1. Each hit scores the pop bumper value, increases the Black Suit Multiball jackpot and counts down the number of hits remaining to complete the level. Getting the 25 hits to complete the first level increases the number of hits needed to complete the next one and adds 2.5K to the pop bumper value. Completing level 1 also scores 100K and each subsequent level scores an additional 25K. However, the pop bumper value and the "level completed" bonus both reset to 10K and 100K respectively at the start of each ball. As you can see, the value builds up during the game provided you don't drain, and as well as earning a nice "level completed" bonus, all those hits increase your Black Suit Multiball jackpot value. It's not a significant contributor to your scoring, but the spinner is worth 10K per spin, increasing by 2.5K with each shot to the light lock standup target. It resets to 10K again at the start of each ball. Now, above the bumpers are the top rollover lanes spelling W-E-B. These used to increase the bonus multiplier when completed, but now just give a points award which starts at 50K at the start of each ball and increases by 5K each time they are all lit. There is another set of rollover lanes at the bottom of the playfield in the two inlanes and two outlanes. These spell out the H-E-R-O inserts which are lit by rolling through them. Lane change is also available to cycle the lit and unlit lanes, while completing all four letters increases the end-of-ball bonus by 1x. As usual, the bonus multiplier is applied at the end of the ball, where the only bonus value is a score based on switch hits during that ball plus 5K for each lit spider arrow shot made. There are no mode bonuses, other scores or anything like that. The final element is the extra multiplier achieved by the third skill shot (if you got it) which seemed like quite a small award at the time but in this instance is worth another 15 million points. There are two more features we haven't covered yet in Spider-Man, so let's look at those now. Combination shots or combos are a long time favourite for many players and indeed some games (Demolition Man and Corvette for instance) rely heavily on them to achieve a decent score. Well, Spider-Man also goes big on combos, turning them into a feature with different levels just like the pop bumpers. After shooting any ramp or loop shot, the red arrows will flash on the remaining shots for a few seconds to allow you time to shoot one with a follow-up shot and create a combo. If you make it, you then have a few seconds to make another combo shot and so on. Combo values start at 305K for a 2-way with an extra 30K for each extra combo in the sequence, while the base value increases 5K for each combo sequence you string together. That base value is carried through the game and doesn't reset each ball. If you get a run going, you start scoring some good points the longer you can keep making combos without the arrows timing out. And don't forget those shot multipliers because they multiply the combo scores too. Normally, the a loop shot wouldn't continue all the way round and would feed the pop bumpers, but since that would kill the chance of getting a combo sequence going, the two controlled gates at the top of the left and right loop shots open when the combo red arrows flash, to allow balls to orbit completely back to the flippers for another combo shot. Apart from your combo sequence length, each combo is also recorded for a game long tally. After scoring a total of 10 combo shots in any sequences, you start super combos where your next combo shots score an extra 250K bonus points. And once again, shot multipliers are your friend here too. Super Combos start again every 10 combos when the super combo bonus increases by 50K, and they end when the ball drains. Every 25 combos Super Loops starts. This allows all orbit shots to make it all the way round rather than being stopped by one of the control gates at the top, making them worth 400K each. These also continue for the remainder of the ball and will increase in value by 50K is they are restarted by another 25 combos while already running. Beyond that, at 50 combos there is a two-ball combo multiball. There is a high score entry for the player with the most combos during a single game and there is another high score entry for the longest combo sequence. Spider Sense is the feature directly underneath the upper flipper. 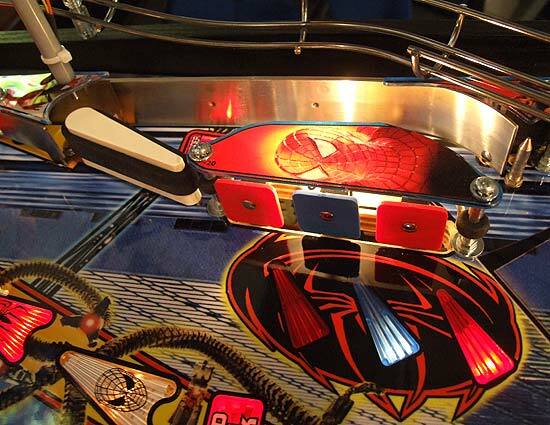 To light spider sense you need to complete the three stand-up targets below the flipper. When you do, you will get a display showing you what award you have put in your Spider Sense store for later collection. If you're playing a mode, you will earn a bonus for that mode which you can store away. That bonus is then built up for the remainder of the mode until it finishes or you collect it. It makes sense, therefore, to get the Spider Sense targets early in a mode, so you have the maximum time to build the bonus value. If you aren't playing a mode it will be a fixed points score you'll be storing. When you've got something in the Spider Sense store, you can collect the contents by rolling through the lane behind the standups in either direction. If you've got several bonuses stored, you collect them all but if you haven't collected them by the end of the game, you lose them. If you build up some nice values and then collect them, you can make it to the Spider Sense high score table for the highest total value collected during a game. At present, there is only a standard match sequence at the end of the game. That too will probably improve over time. That concludes the rules section of this review and it's time to look at the remaining elements of the game in turn, to see how they rate both individually and as part of the overall package. We'll begin with the playfield layout. From the outset, the shots available in Spider-Man are clear and - for the most part - satisfying. 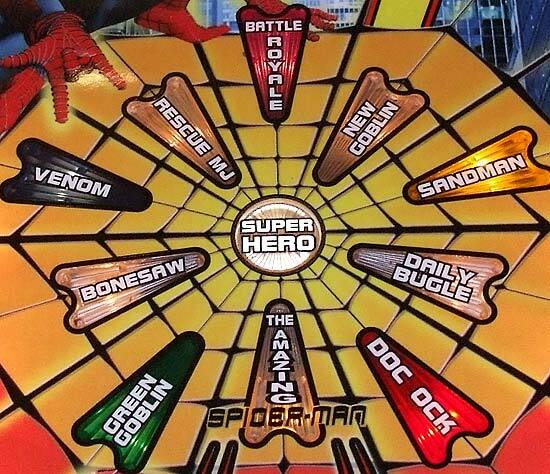 The loops, ramps and targets are all indicated with big, bright inserts with large lettering, leaving Spider Sense as the sole riddle for the player to work out. The left and right ramps are good for passing the ball across flippers although there's a nagging feeling the left Venom ramp should have been used for something else instead of a companion to the side Venom ramp. Making that side ramp, though, is just as rewarding as you'd expect for what is probably the hardest major shot in the game. Meanwhile the upper flipper is put to good use with a range of possible shots including both Venom ramps, the Sandman bank and the classic temptation where you use it for the lower Green Goblin targets but shoot straight down the left outlane instead. 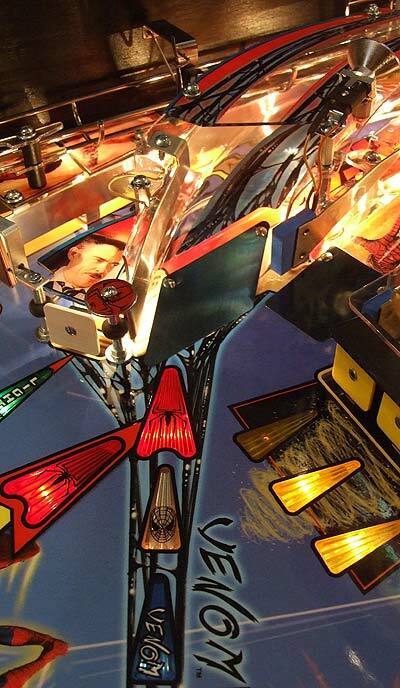 There are no other real sucker shots in the game with anything pointing back at you positioned in the top third of the playfield to give you reaction time, and even the motorised 3-bank is angled slightly to reduce centre drains. The orbits feed nicely to the flippers unless you have hyper-sensitive slingshots, leaving only the lower Green Goblin and Spider Sense targets as potential quick drains. If a rebound does head for an outlane, there's plenty of rubber around that area to help you work on an escape plan. The centre post can also help you out if you've the confidence and judgment to use it wisely. With the lack of sucker shots and drain prevention aids, it's no surprise to find fairly long ball times on Spider-Man as shipped from the factory. Designer Steve Ritchie has suggested widening the outlanes by moving the adjustable posts to their highest setting which makes sense. It's easy to draw comparisons between any new design and those classic playfield layouts from the past and there are some obvious similarities between Spider-Man and Attack From Mars. The motorised three-bank and targets behind do bear a striking similarity to the saucer area in AFM, but to give credit, Steve used the motorised three-bank first in Black Knight 2000 and a good idea then is still a good idea now. None of the characters' animations could be described as exciting and if you concentrate on the lower part of the playfield you could almost be forgiven for missing them. The solenoid on Green Goblin, although not an important part of the game, really didn't live up to the possibilities. Would it have been better with the intended motor to drive it? Probably, but if it means the money can be better spent in more significant areas of the game, it was a wise choice. But the best thing about the layout, though, has to be the speed and flow of the ball around the ramps and loops as you try for more and more combo shots or pile up the multiple jackpot awards. In those situations, you really get a feel for the intensity of the game and the feeling everything is fusing together as it should - in the way it was intended to be played. 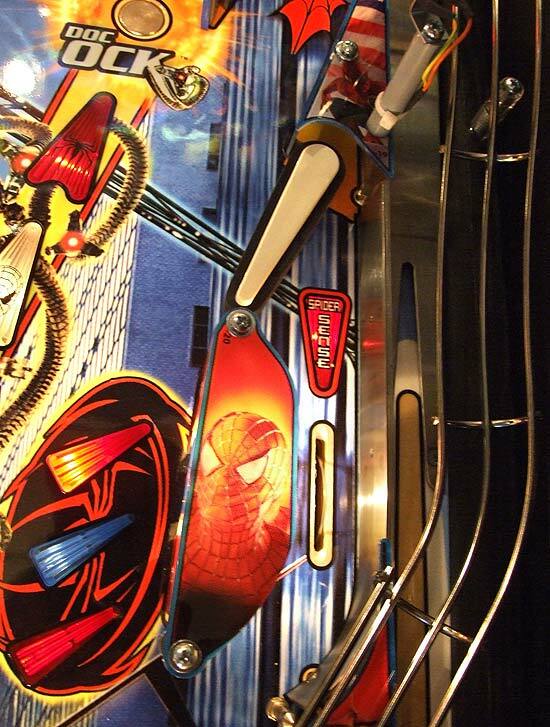 Spider-Man has to score highly on both theme acceptance and recognition as well as the way it is implemented in a pinball game. Many people will profess to not being a fan of the Spider-Man comics or movies, but unlike the reaction to Family Guy, for instance, not being a fan doesn't mean they are hostile to the theme. In licensing terms, Spider-Man ticks many of the boxes. There is a high level of brand recognition, a general positive attitude towards it, while it is family-safe, timeless and positive. 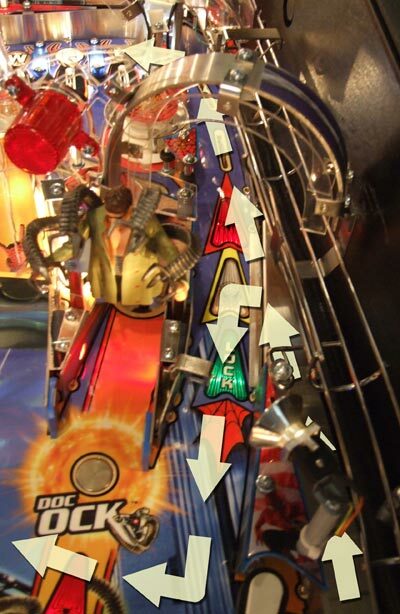 In pinball terms, the new movie is a peg to hang the release on and it provides a range of scenarios from all three movies suggesting modes, quotes, artwork, music and characters to utilize. The only problem is the lack of a central character in the game. Spider-Man himself is plastered all over the backglass and cabinet, but in the game it is you, the player, who takes on the role of Spider-Man to battle his enemies. That means narration has to be provided by one of the lesser players in the movies, JK Simmons who plays Daily Globe Editor J Jonah Jameson. As the one who charts Spider-Man's trials and tribulations, it makes sense but he's still some way down the billing behind Peter Parker's aunt. As you've seen above, the rules have some complexity and legs to them at this stage, with more depth yet to be added. The basic tenets are well-defined in this game as in some of Lyman's previous works - shoot the same thing over and over until it submits and comes alive. Do this to various different things around the game until they've all been completed and something better happens. That's a very simplistic description because it ignores the in-built strategic complexities in the ruleset for the more advance players. But for a new player, or someone who doesn't want to get too deep into the rules, that's the "Pavlovian Pinball" (as Gary Stern calls it) principle of leaning; to keep shooting a thing until you get the reward from it. It might not make for the most imaginative rules, but it does make them understandable for the average player. 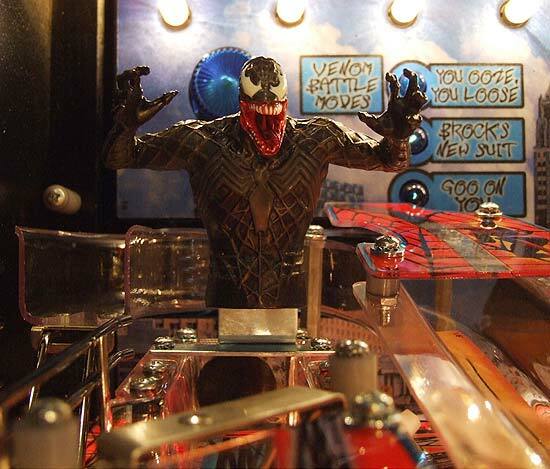 The more advanced player will love to way multiple modes can run concurrently - all four villain modes (Doc Ock is always a multiball), a timed mode and Black Suit Multiball call all be active at the same time, although whether you'll be able to keep track of them all at once is a different matter. Frames from the display effects have punctuated this review so you've already seen how many modes and features are illustrated on the dot matrix display. What you haven't seen is how Spider-Man represents a change in emphasis from hand drawn animation to digitised clips. 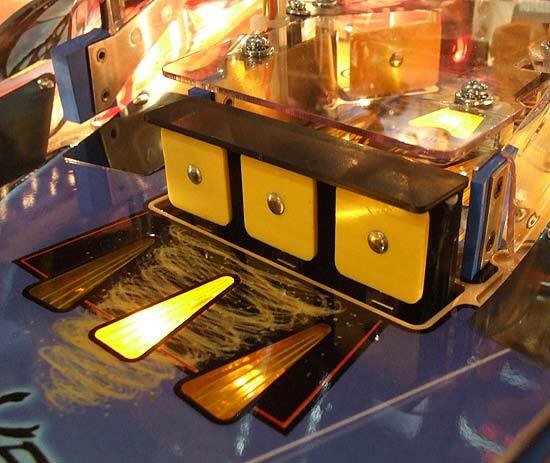 Before the current SAM system was introduced, all pinball manufacturers were limited to four basic shades of orange for their displays - black, dark, mid and bright. One of SAM's benefits was the introduction of 12 luminance levels. This allowed for better fades, shadows, and more realism in the images. Now that has been turned to video-like sequences which run full-screen on the display. There's no layering of information such as scores or points awards, they're clips that run and when they stop, information is added. Here are some examples rolled together into one sequence. The feel of the clips is reminiscent of the way Premier/Gottlieb games of the mid '90s used their displays to show short sequences from movies such as Waterworld and high speed motor racing in Mario Andretti. Premier/Gottlieb were never very successful in their attempt to reduce full colour video to just four shades of orange and although Stern's Spider-Man is better, the results are still patchy. 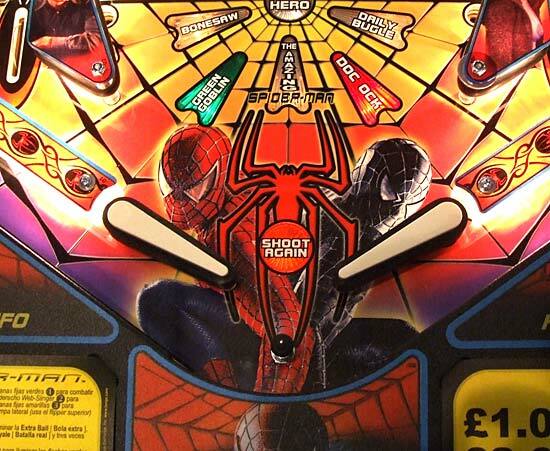 Bright clips definitely work best, but unfortunately, much of the third movie deals with Spider-Man's dark side - both emotionally and literally - and while his black suit may look good on the big screen, it's not well-suited to a pinball display. There is an additional problem when the clip ends and the award or score is layered over the last frame. Often, the final frame looks like some random pattern that makes no sense by itself. Sometimes though, the final frames work well as in the example below, so it may just be a matter of shot selection and that might be a something decided by the licensor. But there was still much work to be done before the display effects were completed in this revision of the code, so perhaps some re-grading can be done to lighten the darker clips and find some better end frames? Although many locations turn the sound down to inaudible levels, it still plays a major part in the enjoyment of a game and the more frantic and complex a game, the more you rely on audible cues to let you know when a shot is made or a feature completed. The sounds can be broadly split into the three areas - effects, quotes and music. This is a game about epic battles between good and evil. Subtlety isn't called for. What we want are lots of destructive and explosive effects for the battles and sure enough that's what we get. Hit Green Goblin's targets and you know about it. The same with Venom. You're never in any doubt whether your shot made the switch or not. Making the combos brings forth a series of "Woo-Hoo"s from Spider-Man as he strings together a series of swings across the cityscape. You hear the call, you know what to do. The sound effects are also well synchronised with the display effects, making the whole greater than the sum of the two. Speech quotes are more difficult, since there was a lack of them in this version. J J Jameson gives advice and taunts you when you fail to collect the extra ball, but didn't feature much. He surely will play a greater role in the game once his full range of quotes is included. The quotes elsewhere come from Green Goblin and Doc Ock during their respective modes and change to mood from fast paced action to menace and even slight sadness, if only for a brief moment before the battles rage on once again. The final part of the sound package is the music and Spider-Man excels in this area. 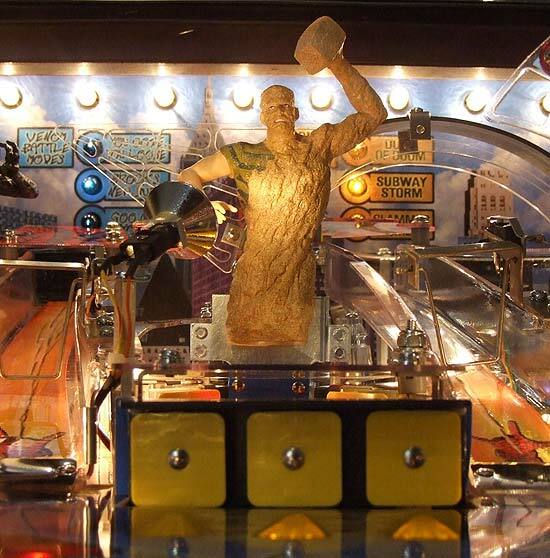 Some people have expressed their disappointment not to hear Danny Elfman's themes from the first two movies in the game, but while they were fitting to the movies, they are not suited to the gladiatorial battles in the pinball game. David Thiel has captured the mood perfectly with his rocking tracks with special mention going to the Green Goblin screaming guitar theme which cuts through all the action and tells you to shoot the left targets without any visual clues whatsoever. In the software we tested, several tracks were missing so, what was already a highlight, looks set to get even better. This is definitely a game that would benefit from speaker upgrades and a nice meaty subwoofer fitted to the base of the cabinet. Normally in an unfinished game, the lighting effects wouldn't have been implemented fully, and while that's possible in Spider-Man, the light show was already more than adequate with good use of spotlights and those flashers in the pop bumpers. Putting three flashers in one area is going to have a dramatic impact and they are certainly effective in producing a flood of white light in the bumper area when the pops are firing. Which is just as well, because the LEDs on top of the bumpers are totally under-whelming. But, they can be replaced with something more effective quite easily so it's not a major issue. The flashers are just as effective around The Sandman, almost blinding you as your shot hits home, adding a third level of impact to the sound and display effects. The general illumination level is well balanced. As you can see above, the only slightly dark area of the playfield is around the upper flipper but even that's not significant enough to cause any problems. So here we come to the end of the in-depth review and the time to draw all the different elements of the game together and form some conclusions. Spider-Man is definitely the adversarial kind of game at which designer Steve Ritchie excels. He enjoys throwing the player into a battle against a tangible enemy, one you have little chance of ever defeating but one you'll want to fight anyway. In Black Knight your opponent is there on the backglass, taunting you. In High Speed and The Getaway, you're battling the cops, in Star Trek-TNG you're fighting the Borg and the Romulans. These are the aggressive, high impact games he does so well. But lately, the themes have not been so sympathetic. In Elvis and World Poker Tour you have no enemy and so the reasons to play are less clear cut. Spider-Man, then, was a natural for Steve and he's not disappointed us. Without the theme, the playfield would need to be more quirky and imaginative, but when the objectives are so clear and you need speed and relentless hammering to achieve them, a design where everything just works is more important that clever but frustrating shots. It's not a perfect game and we've highlighted the areas where improvements are possible, but it's a darn good game which will get even better as the software implements the missing features and adds polish to those which are part finished. Lyman is still working to finish them as this review is being written. The game plays fast and furious, looks great and the music tracks rock. So lock the doors, dim the lights, crank up the volume, and start the battle within. Finally, here are the Editor's personal rating for the game in its current state as reviewed, running different versions of code from 1.05 up to 1.30. Areas such as Layout and Art are unlikely to be revised from their ratings but as various changes are made to the software, some of the other ratings may rise if the changes are positive (or fall if they impact negatively on the game). The potential for improvements has already been stated, but if no more changes are made, these will be the final ratings. Remember, these are proper marks out of 10 for each element of the game, so a rating of 8 means Spider-Man is 80% as good as the best ever game in that category. They are totally subjective and are included only as a guide. If you jumped straight here, go back and read the full review to see whether you agree with them and if you put the same significance on certain features as the Editor. Our thanks go to everyone at Electrocoin for their assistance with this review, to Derek Musket for fact checking and Tom Kennedy for updating the rules. Thank you to readers, contributors and friends for their patience while the review was completed. With 48 large images, 149 display images along with the videos and the 11,351 words, it takes many, many days to compose an article such as this.